All of you are so amazing~thank you so much! I do not even know her favorite colors, so I just hope for a good variety to brighten a mood. Thank you for being my blessing! ~sandi ETA that honestly I've never put squares together, so there is no time frame. I am so excited to learn!!! Love it, Darski! Here is Cat's One Piece Wonder set, found here: http://cats-rockin-crochet.blogspot.com/2011/05/cats-one-piece-wonder-baby-diaper-cover.html and here: http://cats-rockin-crochet.blogspot.com/2011/05/cats-one-piece-wonder-baby.html ETA I had to re-rinse after this pic, as somehow it came out linty and with detergent stuck to it! ??? Looks better now~that left sleeve especially. Still looking forward to your pics, Darski! 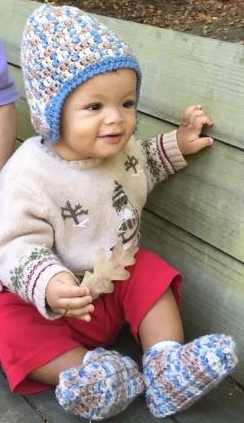 I am actually considering your star baby pattern if I can fit it in before delivery... Also have a pic of another sweater set to share when I charge the camera. Finished the bag, and a friend is lining it for me. Then I'll get a pic of that as well. Care of a crocheted bag? OH YAY! Y'all are making my day~*THANK YOU! * soooo very much! I've read many times that RHSS holds up well, and that was one of the reasons for the choice.